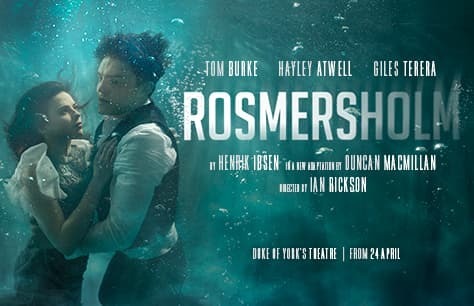 Rosmersholm tickets are your chance to see Ibsen's masterpiece in the West End's Duke of York's Theatre! Ian Rickson directs Tom Burke, Hayley Atwell and Giles Terera in the West End premiere of Duncan Macmillan‘s startling new adaptation of Henrik Ibsen’s gripping and piercingly relevant work of personal and political passion Rosmersholm. An election looming. A country on the brink. A rabid press baying for blood. At the centre of the storm stands Rosmer’s home, the grand house of an influential dynasty. This is where the future will be decided by John Rosmer – a man torn between the idealised hope of the future and the ghosts of his past. ‘Ibsen’s masterpiece’ (Michael Billington, 2008) is a twisting thriller and stars two electrifying actors in the leading roles. Tom Burke (Strike, The Musketeers) is the soulful Rosmer haunted by history and tradition. Hayley Atwell (Howards End, Captain America) is Rebecca West, one of Ibsen’s greatest heroines. Enigmatic and unpredictable, free-spirited Rebecca brings the winds of change to Rosmersholm with the force of a hurricane. Giles Terera (Hamilton, West End) is Andreas Kroll, a powerful moral voice, who struggles to reconcile his friendship to Rosmer amidst the changing political tides. Cast also includes Lucy Briers (Wolf Hall, West End/Broadway and The Seagull, Chichester Festival Theatre), Jake Fairbrother (Lady from the Sea, Donmar Warehouse and The Maids, HOME Manchester) and Peter Wight (The Birthday Party, West End and Hamlet, Almeida/West End). Rosmersholm is the tenth collaboration between Sonia Friedman Productions and director Ian Rickson (including The Birthday Party, Mojo, Old Times, Betrayal, Jerusalem) and marks a second time working with award-winning writer and director Duncan Macmillan, who previously collaborated with Sonia Friedman Productions on the West End and Broadway run of 1984, which he co-adapted/co-directed with Robert Icke. His other plays include People Places and Things which enjoyed huge success in London and New York. 24 April - 20 July 2019.